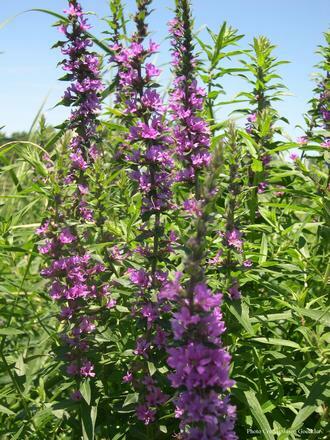 Purple loosestrife is a wetland perennial that can grow to be 7' tall. Plants will get larger and bushier with each year of growth. Leaves: Each pair of leaves are at right angles to the pairs directly above and below it. Occasionally leaves appear in groups of three. Flowers: Individual flowers have 5-7 pink-purple petals surrounding small yellow centers. Flower blooms July through September. Fruits & Seeds: Fruit is a 2-valved capsule. Roots: Large woody taproot stems with extensive rhizomes can send out up to 50 shoots. Purple loosestrife invades many types of wetlands including, wet meadows, marshes, river and stream banks, ponds, lake edges and ditches. Once established it can quickly form dense stands that displace other emergent wetland species.